Bedbugs are back. 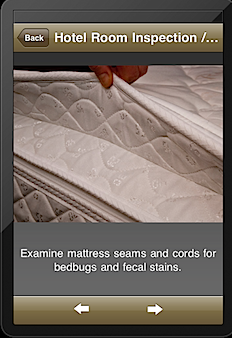 For many people, this is only slightly curious, since their understanding of bedbugs stops at the second half of the bedtime admonition “Sleep tight, don’t let the …”. 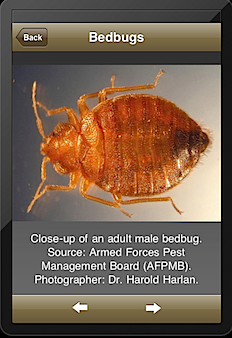 But, for those others who have experienced a home bedbug infestation, it is a modern nightmare. The tiny critters can hide in any furniture crevice or fabric fold and come out only in the wee hours of the night in search of their favorite food: human blood. Their bites cause intense itching which can last days to weeks and they can remain dormant and hide for months. The cause of the recent resurgence is unknown. It does not seem to be paying any great regard to socioeconomic status nor to cleanliness. In metropolitan New York, it seems to have caused a minor panic, with families having to temporarily move out of their homes for toxic fumigation and thousands of dollars of clothes and artifacts being disposed of for fear of contamination. For a chilling recounting, check out this article in the UK Guardian: How bedbugs invaded New York. 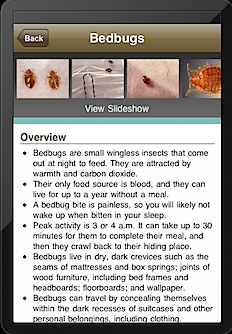 Since so many skin afflictions are related to insect bites, the folks at Logical Images have just released Bedbugs ‘n Things, an iPhone app that describes the most common perpetrators of insect bites, identification by the appearance of the bite marks and recommended treatment. For bedbugs in particular, it goes further and gives a thorough set of guidelines for concerned traveller so they avoid bringing home uninvited travelers inside their luggage or clothes. The app is $0.99 on the iTunes app store (link). As with other Logical Images titles, the image quality is excellent. The accompanying explanations are concise and easily understood. There does not seem to be any unneeded information and the variety of images of skin infestation helps frame the variety of presentations. The Travel Checklist demonstrates, using photos, an exhaustive list of places to look for bedbugs in a hotel room that would please the most neurotic traveller. Information on scabies and ticks is also welcome. Not much in terms of the app, which easily seems to deliver on its promise . 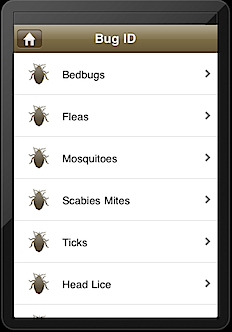 Perhaps a future Pro version may include other organism borne skin diseases such ring worm, spider bites, leshmaniasis, etc.